The Grand Crus of Alsace were created in 1975 and feature 51 classified areas defined according to strict geological and climactic criteria. The designation is attributed to wines satisfying a number of quality-related criteria: strict limitations on terroir, highly restricted yields, specific rules of conduct regarding the vines, minimal natural ripeness levels and taste . The appellation Alsace Grand Cru recognizes the most exceptional terroirs, which impart to the wines an expressive character and a unique authenticity. The size of these exceptional vineyards varies between 3 and 80 hectares. Only 4 grape varieties can be used to produce Alsace Grands Crus wines: Riesling, Gewurztraminer, Pinot Gris and Muscat (Alsace variety). 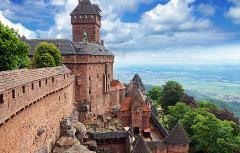 Discover these unique Grands Crus wines during an exceptional day out in the Alsace wine region. This private full day wine tour has been crafted so that you may have the privilege of tasting some of the most outstanding Alsace wines. Your wine tour will first take you to the Ribeauvillé wine producing region. Here, taste fabulous Rieslings that originate from the Kirchberg (marl and sandstone), Geisberg (marly limestone) and Osterberg (calcareous marl)Grands Crus. The hallmark of Ribeauvillé wines is their minerality. In fact, while most Grand Cru Rieslings have 1.5 g solids/liter, Ribeauvillé wines often reach 2.5 g/liter. Some of the most famous wine makers that produce these Grands Crus include Trimbach or Louis Sipp. Then, move on to discover a most unique and confidential Grand Cru: Kaefferkopf (literally ‘beetle head’). 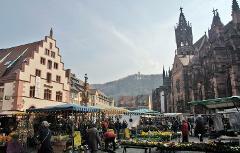 Divided into several sectors of the charming little town of Ammerschwihr, this Grand Cru is characterized by a complex geological substratum, combining granite on its upper parts with shelly limestone then sandstone lower down. Depending on availability, it will also be the moment to discover biodynamic wine making (a form of alternative agriculture very similar to organic farming, but which includes various esoteric concepts) in wineries such as Domaine de la Sinn or Domaine Martin Sschaetzel. 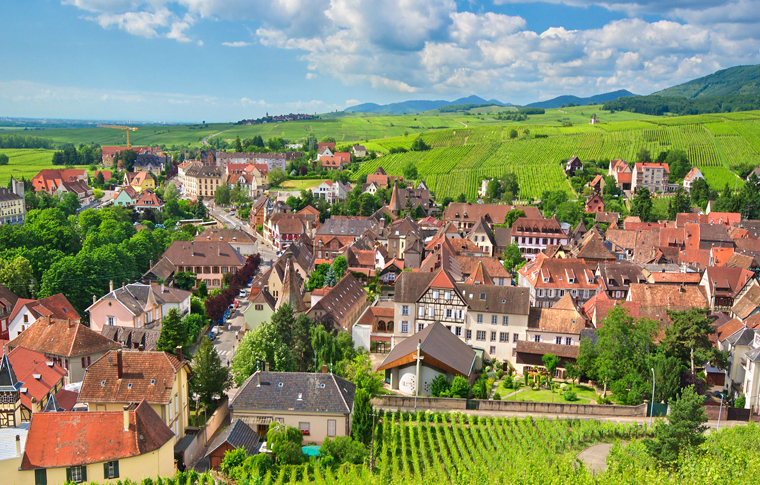 Finally reach the southern part of the Alsace wine route and discover emblematic Grands Crus such as Steinart, Goldert or Hatschbourg. It is in this part of the wine region that you will discover local Muscat. 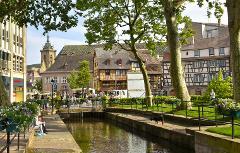 Alsace Muscat is distinguished from the sweet Muscats of the South of France by its dry character. Extremely aromatic, it expresses wonderful flavors of fresh fruit. We will also have you taste some exceptional Gerwurtztraminers that originate in the Hatschbourg Grand Cru. These are full-bodied wine, with solid structure and a round fullness. In tasting these wines, one rediscovers the complete aromatic palette, often with the addition of liquorice. Harvested very ripe, “late harvest” and “Selection de Grains Nobles” Gewurztraminers ranging from sweet to viscous, possess exceptional richness and extraordinary aromatic complexity.